The client, a supplier of an injectable, inorganic bone cement, reported occasional instances of syneresis (separation of fluid phases from solid phases) in batches of cement. This was evident both during product storage and at injection. Before finding solutions, the client correctly asked for support on identifying a robust analytical technique for differentiating between “good” and “bad” samples. In-house rheological measurements had failed to sufficiently differentiate samples. Lucideon introduced the client to oscillatory rheological measurements that quantified the visco-eleastic behaviour of the cements. Measurements at Lucideon provided trends in the storage modulus (representing elastic behaviour contributions) and the loss modulus (representing plastic behaviour) for good and bad samples. Lucideon was also able to provide insights on key materials and processing variables most likely to be impacting on the tendency towards syneresis (with theories as to why). Additional analytical tests (e.g. XRD, DSC to pick up changes in crystalline phases) to support the theories were suggested. The client was able to use the information generated by Lucideon’s experts to determine process control changes that ensured the consistent production of ‘good’ batches. More importantly this investigation by Lucideon enabled the identification of the cause of the syneresis. Remedial action was then implemented. The G' and G'' plots show how much plasticity (G'') and elasticity (G') exists in the sample as the temperature of the sample is increased and subsequently decreased. It can be seen how, upon cooling, we end up with more elastic or solid behaviour (G' becomes > G''). 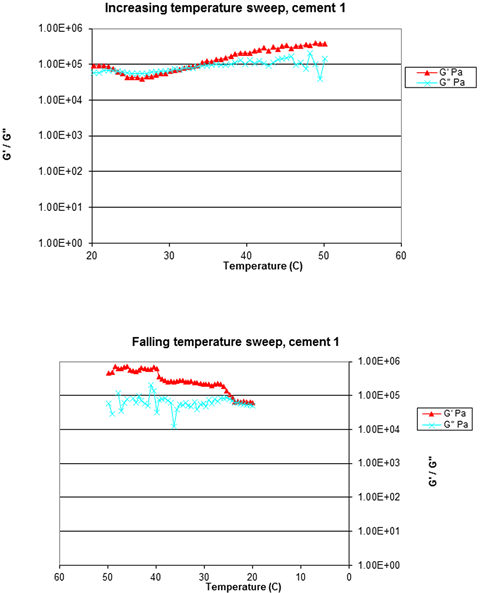 This showed that high temperatures generated during product mixing cause an irreversible change to the cement structure. This change was linked to syneresis.